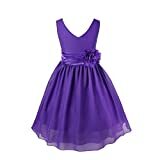 Gorgeous Kids Girl’s Sleeveless Chiffon Party Dress. V-neck, pleated waist with flower pinned brooch. 3 layers skirt, top 2 chiffon layers and 1 lining with netting for fullness.